Learn how to grow turmeric plant in pots at home garden including its pictures, fertilization and pests and diseases, and turmeric plant care. Turmeric Plant is a perennial herb that re-shoots every spring. The scientific name of turmeric plant is Curcuma domestica syn. Curcuma longa with family ingiberaceae, the ginger family (how to grow ginger). The popular varieties of turmeric plant are Curcuma longa, Curcuma zedoaria and Curcuma aromatica. Turmeric is known by different names in different countries. Some of the turmeric names are Turmeric Root, Curcumin, Curcumine, Curcuminoïde, Curcuminoid, Curcuminoids, hidden ginger, Queen lily, Indian saffron, ukon, Yu Jin, nghe, wong-keong, Rhizoma Cucurmae Longae, Curcuma, Curcuma aromatica, Curcuma domestica, Curcumae longa, Curcumae Longae (Latin name), Curcumae Longae Rhizoma, terre merite in French and Haldi, Halada, Haridra, Indian Saffron, Nisha, Rajani, Pian Jiang Huang, Racine de Curcuma, Radix Curcumae, Safran Bourbon, etc. Turmeric health benefits are now well established. 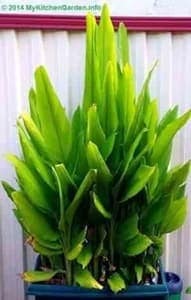 The turmeric plants have very attractive large leaves which will give your garden a lush tropical look (see the picture of turmeric plant below.). You can use fresh turmeric root or turmeric powder in vegetable curries and also in many natural beauty recipes. Growing turmeric organically in pots at home garden is not difficult using a turmeric root if you follow the step-by-step tips and turmeric growing information given below. Although it is a tropical plant that thrives on heat and moisture, turmeric plant can be grown in temperate areas in summer. I am growing turmeric in Sydney, Australia in pots, the plants look great with its stripy long leaves year round, except in winter when the leaves become yellow. I have encouraged many of my friends in Australia to grow turmeric, and they are now growing it in pots. The turmeric plants grow 70-90 cm high and will slowly spread to form large clumps with underground rhizomes. The plants have broad green tropical-style leaves providing a beautiful view throughout the summer growing season. The turmeric plant produces very beautiful and attractive white flowers (see the photo of turmeric flower). The eating part of the plant is roots or rhizomes. In India, the Haldi roots are cooked and eaten as vegetable curry with roti or bread. In Indonesia, the young shoots and rhizomes are eaten raw. Growing Turmeric in Containers or Garden Beds? Turmeric can be grown both in garden beds or in wide containers with similar yield. Only requirement is that the soil should not be water retaining, as water-logging will rot the rhizomes, reducing the yield. I planted 4 turmeric rhizomes in a pot of size 75 cm long, 30 cm wide and 30 cm deep 2 years ago. The turmeric plants produced more than 5 kg of fresh turmeric in 2 years, and the plants are still going on for the new crop. The advantages of growing turmeric plant in containers is that the plant can be moved in sun; and also indoors if there is snow or frost. Another advantage of growing turmeric in pots is that you can grow turmeric if you live in an apartment and you don't have a garden bed. In India and elsewhere, grow your own organic turmeric in pots in balconies, verandas, terraces, backyards, front yards, and similar places. Turmeric is a tropical summer plant, needing heat and moisture, temperatures between 20 and 30 °C (68–86 °F). The plant will die in the winter. The plant can grow anywhere in summer. It can grow in USDA Zones 7b - 10b. The plants can not tolerate climate colder than 18°C. As a matter of fact, turmeric can grow in any zones if the roots do not freeze like south Florida where it can grow outside even in winter. In Australia, turmeric plant can be grown in Sydney and other cities in summer. In tropic regions, turmeric can be planted any time, but elsewhere plant it in spring to summer. I found that turmeric roots sprout well when the soil becomes warm. Turmeric thrives best in direct or indirect sun, but it can also grow in light shade. However, heavy shade for prolong time will reduce the yield. Also if grown in in full sun, keep the soil wet at all the time. Turmeric plant requires a well-drained loamy fertile soils. Mix cow manure, compost (how to make compost), river sand and some all purpose fertilizer (garden soil preparation ) in the soil. Turmeric can be planted by rhizomes as the plant does not produce seeds for propagation. You can start your turmeric plants by using turmeric rhizomes like ginger. The dturmeric roots available in Indian griocery stores are completely dry, not suitable for planting. You should buy fresh turmeric roots from garden shops or vegetable shop. In Australia, I have never seen them in Flower Power garden center or Woolworths. Asian vegetable shops always keep fresh turmeric roots, from where you can buy a few and plant. Always buy firm rhizomes with at least one "eye", avoid dried or soft ones. Pot should be at least 30 - 45 cm (12-18 inches) wide and 30 cm (12 inches) deep and fill it with nutrition rich free draining organic soil. Buy some turmeric roots from vegetable shops to grow your own plants. Or you can plant rhizomes from your previous year's produce. Select small rhizomes with two or three buds (eyes). You can call them seeds. You can plant turmeric rhizomes 20-25 cm apart, just bury them in wet soil 6-7 cm deep, or plant them on ridges. Do not water until the shoots appear. The roots will germinate/shoot in 3-8 weeks depending on the soil temperature. How to germinate turmeric in colder regions?Isom has suggested to use a 60 watt incandescent light bulb in an oven and place the pot to raise the soil temperature, which helps in sprouting the turmeric root. You can measure the temperature on top and bottom racks with a thermometer. The air temperature on the top rack can reach up to 110°F (43°C), while on the below rack can be 100°F (38°C). As for sprouting (or germinating seeds) that require warmer temperature to get going --What I've done is replace the 40 watt oven light bulb with an ordinary 60 watt bulb and keep it on. It has to be an incandescent bulb too that gets hot. I put a thermometer in the oven to check the temperature. On a top rack near the bulb, air temperature is 110°F (43°C), although soil temperature is much less but still very warm. Closer to the front of the oven on a rack near the bottom, air temperature is 100°F (38°C). Some seeds like it VERY warm for germinating like tomatoes. You need to grow fresh plants every year. Or leave a few roots inside while harvesting, it will re-shoot in spring. Once the plants grow, keep them well watered. Bring your turmeric indoors if the air temperatures goes below below 10 deg C or 50 deg F.
Note: You can start turmeric in pots indoors and move the pots outdoors when the temperature start to rise. The turmeric plants require consistently and adequately watering. Over watering will slow down growth. The tips of the turmeric leaves will burn if the plant is in too much mid day sun or if the soil becomes dry. If you are growing your turmeric in a container, water only when you feel the soil slightly dry to the touch. This will prevent leaching out of nutrients due to over watering. If your turmeric is grown in a sandy soil or your plant is growing in dry low humidity area, water often or mist the leaves. Fertilize your turmeric plants 4-5 times using a general purpose vegetable and fruits fertilizer during the growing period. Fertilize around the base of the shoots but away from the stems. I fertilize my turmeric plants with a general purpose liquid fertilizer during the growing season every third week. If growing turmeric in a container, feeding with fertilizer will provide adequate nutrients to the plants. If the turmeric leaves becoming yellow or burn at the edges, it means that you are over-watering and/or signs of insufficient nutrients. You can harvest turmeric in 9 to 10 months after planting. The leaves turning yellow or stems drying are indications of maturity of turmeric plant and the correct time/season for the turmeric rhizomes to be harvested. Harvesting is easy, just dig up the entire plant including the roots. Sometimes I do not harvest the whole turmeric clump as it is difficult to consume so much. I just dig carefully at the side of a clump and remove rhizomes as needed. I have harvested approximately 800 grams of fresh roots per plant. White Turmeric (Curcuma zedoaria, family Zingiberaceae, also just called Zedoaria) bears yellow flowers with red and green bracts. It has a stronger pungent taste similar to ginger with a smell of mango. In India, it is known as Amba Haldi. The white haldi is used as spice and salads and pickles. The root is good for digestion. Tiny spider mites may pose a problem. The spider mites in large numbers may kill the plant. Forceful water spray of the turmeric plant can wash away spider mites. I spray the foliage with neem oil spray once a month. Turmeric plants are prone to fungal diseases such as leaf spot and leaf blotch that cause brown spots on the leaves and may cause leaves to dry and wilt. Spraying an organic fungicides can help. The root and rhizome rot can dry the leaves and rhizomes are decayed. Wipe fresh turmeric roots and wrap in a paper towel and place in a zip lock plastic bag. Place in refrigerator. This way it will remain fresh for 3-4 weeks. To use, cut the needed piece, and refrigerate again. For longer storage, slice, wrap and then freeze for up to 2 months. Blend turmeric rhizomes with some water and freeze in ice cube containers. Peel the rhizomes and place them in a jar with vodka and store in the fridge for at least a year. Peel turmeric root and place in honey for at least a year. Freezing turmeric retains the texture, color and flavor. However, frozen turmeric is often dried out if not properly packed. Boil turmeric in water, cut the them into small pieces, spread on a plate and cover it with a mesh. Place in sun and let them dry until completely dry. Grind the pieces to a fine powder in a spice or coffee grinder. Store the powder in airtight glass bottle in a cool place. Can turmeric be grown in a pot? How big the pot should be? Yes, you can grow turmeric in a pot of size at least 30 cm deep. It is better to use a rectangular container where you can plant 3-4 roots, 20-25 cm separated with each other. Can I grow turmeric indoors? Growing turmeric indoors in containers is easy. The planting method and care is similar to growing them outdoors. However, it needs direct or indirect sun. You can bring the pot indoors when there are chances of frost. I grow turmeric in a pot in the summer and bring the pot in and it goes dormant in the winter. I need to separate and re-pot. Is it best to do that in the spring or yet this fall? If you want to eat turmeric roots, then winter is the time to take out the rhizomes. In winter most of the leaves and stems will die and you need not to repot. In the next summer, many of the roots inside will sprout. If you re-pot, then you have to take out the whole plant and remove the rhizomes out, except the main root. Repotting the plant when it is dormant can damage the plant as it does not have the enough strength, so repot when it starts to grow. I AM IN KENTUCKY ~ FRANKLIN, KY. I HAVE NOT BEEN ABLE TO FIND A TURMERIC ROOT. You may try any Chinese or Indian grocery or vegetable & fruit shop. Better, you may find turmeric roots on eBay. Hi!...I forgot some turmeric roots in a bag and i realised they have sprouted. It is now beginning of October in Ireland...you think if i pot them and leave them inside the plant will grow?I so love Turmeric root!! !and the plant looks gorgeous! I found mine in the grocery store in the organic vegetable section a year ago. Not knowing what I was doing, I planted them in a large square pot. To my surprise, they grew and thrived. I set the pot outside during the warmer summer months. Since our weather in MA has already turned cold; I brought the pot inside. Yesterday at the grocery store I bought another package so I have more to plant! I bought the dry turmeric root from an Indian store which was of yellow color and very ahrd like a stick. I planted it as described by you but it did not root. Please advise me what should I do to germinate it. Turmeric will not grow from its dry root, it cannot sprout. Get a fresh root and plant it. I love turmeric I just moved to Lubbock , Tx from Los Angeles, California and I must say my body is in desperate need of some I can totally tell the difference from taking it often to not having it in 3 months. So I was looking to see where I could find some in this town and stumbled upon your page and I'm so glad I did. Your step by step instruction is PERFECT. Since I never thought to plant my own you have INSPIRED me. I'm going to run to the local markets out here and see if they have any ((fingers crossed). You may find perfect turmeric roots from Chinese and Indian grocery stores or try online. They are available from Amazon. I bought some turmeric roots at our wholesale Chinese grocers in July. I planted some turmeric roots in August in a rectangular plastic Nestl? Qick box. Here in Pennsylvania I kept it inside in the sun and and it's got 3 leaves on it! So looking forward to using it. Hello. Could you please advise the correct/incorrect way to cut the rhizomes of the freshly harvested turmeric for replanting again. Thanks. Basically, you can keep any of the rhizomes which have 2-3 eyes for replanting again. I plant the main rhizome with roots after removing the smaller turmeric rhizomes from them. You can keep the main plant in the soil and harvest the turmeric from sides. I found fresh turmeric root at Meijer and Kroger in the organic produce department. I've been known to just take bites of them without peeling. I sat three on a shelf over the kitchen sink and it has sprouted and is growing just sitting there! I'm going to plant it asap. Thanks for the soil info! Excellent post on growing turmeric at home! It sounds amazing! I need to try them soon! When you buy the roots for planting, do you have to plant them right away? How much time do you have to plant the roots from the time I get them to the time I have to plant? Is there a way to preserve the roots until I have the space to plant like a week, a month? You can keep the roots for 10-12 days before planting. Keep them in a cool place where the roots do not dry up. You can cover them with a damp cloth. I live in zone 7b. Can I plant in the fall for harvest in mid summer. Are there any specific instructions for winter months outdoor planting. It can dip down to the low 20s F sometimes lower. Turmeric rhizomes should be planted late in spring to summer and can be harvested after 9-10 months. If planting outdoors in ground, the plants will die when the soil is freezing. As I am not in zone 7b, I do not know more than this. In zone 7b, take out the rhizomes in fall, clean them, let them air dry and store. Hi, Greg @ gnrichardson at gmail. My turmeric has gone berserk in a pot and I have about 20 leaves coming up in a 40 cm pot. Can I cut the rhizomes and transplant some of these into another pot or the ground while the growing season is on (summer just started here in Australia) or do I wait until the leaves go brown in winter and then separate. If the leaves are very close to each other, then cutting the turmeric rhizome may damage the root system. You may try cutting from the out boundary of the growth. After cutting, plant and place it where it receives only the morning sun for a few weeks to save the leaves from burning in hot sun. What are some of the properties? Have purchased some roots. Have in pots. Can I separate when they start 2 sprout. You can separate the individual turmeric root, but you should not cut the sprouts from a single root. My previous post submitted as anonymous! Ooops! Harvested my turmeric today and found many rhizomes appeared rotten, others appeared to still be trying to grow. Only two or three looked even remotely usable. These were planted in pots in April of 2016. The three that appear to be usable, should they be replanted right away or should they be left dormant for a time? I had three that pots that the plants didn't appear to be ready yet so I added some new soil to the top and watered them back in. Thanks for the info! If you planted the rhizomes in April of 2016, you must have taken a good crop by now. It is sad to know that your 24 turmeric rhizomes are now not good for planting. The rhizomes will rot if the soil is not draining well or you are watering too much in dormant period. If it is winter at this time at your place, then you can plant the remaining rhizomes in a new pot and wait for winter to finish before giving water. Please note that the rhizomes will sprout only in summer. Use a pot with holes at the bottom and fill it with well-draining soil. I bought some fresh turmeric roots at an Indian store where I buy other Indian vegetables. I'm eager to try growing it. But it might be problematic and hope you can offer advice. If I can give plants the conditions they need to grow well, I can grow almost anything successfully. Unfortunately, my climate is similar to Seattle's (I live near Vancouver Canada). While our winters are normally mild, they're mostly overcast and very wet. That's fine since I plan to harvest the rhizomes in fall and start new each spring. The problem is our summers aren't consistently warm-to-hot except for 2 months in summer. Being a mild maritime climate, it's not unusual to often have nights with temperatures around 50?-55?F (10?-13?C) in summer. Some summers will fool us and it will be hotter than normal but we don't know in advance, of course. Frost generally comes in late October, rarely earlier and occasionally as late as early December. With climate conditions as described, do you think turmeric could still fare well here? Or is it more likely to languish from lack of heat? Thank you for any advice. 1. Try to sprout the turmeric roots indoors, place the pot near the hottest part of the house, near hot water system or fridge. If they don't sprout then place the pot outside in summer, directly in sun light. 2. Once the roots are germinated, then they will grow and tolerate the night temperature around 10?C. 3. During frost months, move the pot under a covered place, may be under a tree or in veranda, even indoors where you receive some sun light. You may be able to grow turmeric with less yield. But it is good for experimentation, and something is better than nothing. Please share your experience here. Best luck! Thanks for sharing on how to germinate when the temperature is low. I have added this in the text above and on page growing seedlings . Alan, I'm only going by what I read on a forum about growing different herbs. I'll paste the comment along with the link to that page. I hope it answers your question. You need to break up the rhizome at a younger age. If the plant flowers it loses colour and taste, you need to harvest more regularly then ginger (which you can basically grow on and harvest anytime its desired...). Larger clumps of tumeric need to be broken up and replanted to maintain maximum colour. This is why you never see it for sale in large clumps." http://www.shaman-australis.com/forum/index.php?/topic/37355-mystery-turmeric. Please let us know if your rhizome was a single large clump or if it had flowered so others will know what to expect too. Sorry for very very late response, I missed your post. The rhizomes I plant are always single. Harvesting turmeric rhizomes is not possible until the leaves start to die. In the last 5 years, my turmeric plants produce flowers just one time. It is not possible to harvest at very young age as the size of rhizomes would be very small. I always harvest when the leaves start to finish and the color of rhizomes are always very good.